Official: Shootings Suspect Targeted U.S. Military In Germany A top German security official said the 21-year-old man suspected of fatally shooting two American airmen apparently was radicalized over the past few weeks and that he admitted he acted alone. U.S. military officials said it may be too soon to say for sure. German police patrol the Frankfurt airport a day after Wednesday's attack on a busload of U.S. Air Force personnel that killed two airmen and wounded two others. The man suspected of gunning down two American airmen and wounding two others at Frankfurt's airport reportedly told German authorities he targeted the U.S. military and that he acted alone. A federal judge in Karlsruhe on Thursday ordered the suspect held in prison on two counts of murder and three counts of attempted murder pending further investigation. A fifth American was apparently targeted but not injured in the attack. Boris Rhein, interior minister for the German state of Hesse, told the German Press Agency on Thursday that the suspect, identified as a 21-year-old ethnic Albanian from Kosovo, had apparently been radicalized over the past few weeks. German federal prosecutors, working with U.S. authorities, took over the case from state officials Thursday and said they are investigating the shooting as a possible act of Islamist terrorism. In a statement, they said that "on account of the circumstances, there is a suspicion that it was an Islamist motivated act." Rhein said the investigation indicated that the suspect acted alone and did not belong to a terrorist cell or larger network. The indication that we have is that it looks like a lone wolf kind of thing. But without the full investigative side of that, I'd be reluctant to say that for sure. A senior U.S. Air Force commander in Europe, Lt. Gen. Stephen Mueller, said that appears to be the case but it may be too soon to know with certainty. "The indication that we have is that it looks like a lone wolf kind of thing. But without the full investigative side of that, I'd be reluctant to say that for sure," Mueller said. U.S. authorities said Thursday that the suspect was not on any American watch list. The suspect's family told The Associated Press that he was a devout Muslim and was employed at the airport, though German state police had been unable to confirm he worked there. Wednesday's shooting was the first fatal attack in years on U.S. military personnel in Europe. About a dozen U.S. military personnel, part of an Air Force security team, had flown into Frankfurt's airport from their base in Britain and were waiting on a military bus outside Terminal 2 to be driven to Ramstein Air Base when the gunman approached. German police said some kind of argument broke out before the man opened fire with a handgun. The shooter stepped onto the bus and shot again before fleeing into the terminal, where German police and a U.S. airman wrestled him to the ground. A U.S. law enforcement official told NPR that the gunman shouted "God is great" in Arabic as he attacked. Most of the airmen on the bus were part of a force-protection team passing through Germany on their way to Afghanistan, Air Force officials said. At the White House, President Obama expressed condolences Wednesday and said he was saddened and outraged by the attack. "The American people are united in expressing gratitude for the service of those who are lost. Michele and I have their family and friends in our thoughts and prayers, and are praying for a speedy recovery for those injured," Obama said. The suspect is said to be a Kosovo native of Albanian descent named Arif Uka, though the U.S. military could not confirm those details. German police said he was born in Kosovo, but the suspect's relatives in Kosovo told the AP that he was born and raised in Germany. A NATO peacekeeping force has been deployed in Kosovo, a majority Muslim slice of the former Yugoslavia, since a NATO bombing campaign against Serbian forces in 1999. There have been several attacks on American forces in Germany over the years. In 1986, a bomb at a Berlin disco killed three people, including two U.S. servicemen. A German court ruled that Libya was behind the attack. Last year, German authorities convicted five members of a Muslim extremist group on charges of supporting terrorism in foiled plots to attack U.S. military installations. 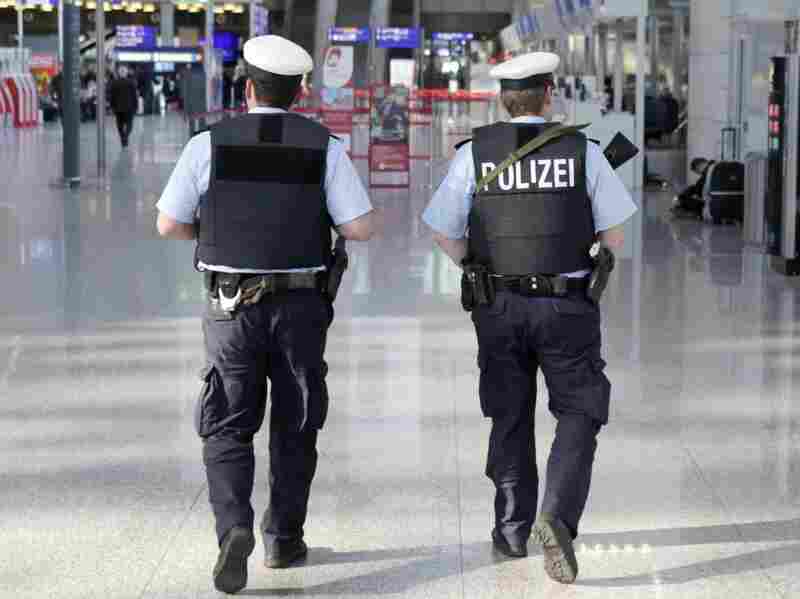 Germany and other European countries bolstered security at airports and transit hubs in November following intelligence of possible terrorist attacks being plotted in Pakistan's tribal areas. But the beefed-up security measures in Germany were scaled back last month — a move that drew criticism for its lack of clarity. On Thursday morning, Terminal 2 at Frankfurt airport was bustling, with few visible signs of any heightened security. Kaweh Nemati, who owns a jewelry shop in the terminal next to where the gunman was apprehended, said he had gone home Wednesday when he got a call from his employees asking whether they should close the store. "It happened right here behind our shop," Nemati said. "I was afraid because they didn't know whether it was one or two men. But the police reacted very quickly." He said he was relieved that his employees weren't hurt and said he's not sure what officials can do to improve security at the terminal. "The police have to check if somebody looks like a terrorist," Nemati said. "I mean, it's hard to say somebody looks like a terrorist, but they have to control the people before they are in the airport. But I think that is very hard to do." At the Fly Away Bar, opposite the jewelry store, barmaid Natasha Stevanovich said she was shocked to learn of the shootings. "I really have no idea how this could happen. Apparently, it was someone who works here at the airport and misused his employee I.D. card, which is horrendous. The whole thing is simply dreadful," she said, shaking her head while polishing a pilsner glass. NPR's Eric Westervelt reported from Frankfurt, Germany, for this story, which contains material from The Associated Press.